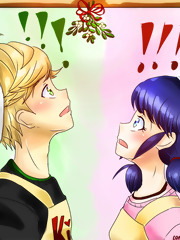 Marinette Dupain-Cheng and Adrien Agreste are madly in love with each other. Duh. It’s so obvious that it’s driving their classmates crazy how oblivious the two are and how resolute they are about not pursuing a relationship with each other. 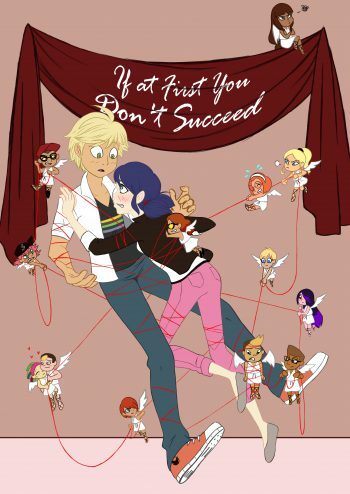 So, they do what any good (and exasperated) classmates would do–band together and try to find a way to get Marinette and Adrien together. Whatever it takes. It might go a bit better if they had a complete set of information to work from . . . like knowing that Marinette and Adrien are secretly Paris’s superhero duo, Ladybug and Chat Noir. Or knowing that Marinette and Adrien know each other’s secret identity and that that’s a major reason for their hesitation. As it is, the class is going crazy . . . and poor Nino just has soooo many questions! If At First You Don’t Succeed is the sort of fanfic that I can just re-read over and over. It’s cute and fluffy and super amusing. The sheer level of involvement from the class and the increasingly ridiculous strategies they come up with are both impressive and very funny. Almost the entire story is told from the class’s perspective, as opposed to from Marinette or Adrien’s, which is the usual. So kudos to the author for the unique perspective; I really enjoyed that. I also liked the Chloe-redemption aspect of this story–it’s nice to see her growing up a bit. Also loved the group-chat parts of the story. They really bring out the maturity of the whole class (ha ha). But seriously, this whole story is pretty hilarious, definitely good for some serious laughs. Add to that some pretty adorable Adrinette scenes and general awkwardness on the part of our heroes, and you’ve got a great story. Recommended. During a random conversation between Ladybug and Chat Noir (while she’s teasing him about his goofy pick-up lines and flirting), Chat brings up the fact that in most relationships, guys do most of the work and it would be nice for girls to initiate sometimes. Not that she immediately agrees, but the conversation does get Marinette thinking–everything she’s tried to get close to Adrien so far hasn’t worked, so it’s worth a try, right? She starts off covering for a trip by saying she’s “falling for him,” and it goes on from there, Marinette pushing past her awkwardness to deliver smooth pick-up lines, and Adrien puddling into a blushing, stammering mess. And when Chat comes to Ladybug complaining about this girl in his class who’s flirting with him, leading her to discovering his true identity, well, things get even worse. After all, turnabout is fair play, considering all the awkward flirting he’s put her through! My, but Pick-Up and Chase made me laugh. It’s cute and funny, almost bordering on crackish but not quite crossing the line. The banter between Ladybug and Chat Noir is spot on. Love the characterizations here just in general; they’re quite well written. And seeing the role-reversal when Marinette takes the initiative and messes with Adrien’s head is pretty amusing–especially when you add Alya and Nino’s reactions into the mix. We get some cute Ladrien vibes here, too, made all the more amusing since to the outside observer Marinette and Ladybug are competing for Adrien’s affections. Basically, this is just a really cute, funny, and oddly romantic story that I enjoyed a lot. Warnings for bad puns and pick-up lines. Note: You can find Pick-Up and Chase at https://archiveofourown.org/works/7568518/chapters/17218156. Poor Alya! She’s so utterly committed to her work writing the Ladyblog, but the fact is she just doesn’t always get her facts right . . . and who better to set her straight than the two superheroes to whom the blog is dedicated, Ladybug and Chat Noir? Only, instead of coming right out and correcting the Ladyblogger, these two troublemakers create ambiguously-named Ladyblog accounts and begin commenting on Alya’s posts. They maybe go a little crazy, actually. Hijinks ensue, and more is revealed about these two trolls than either of them originally intended. The Ladyblog Comment Section was such a fun and amusing fanfic to read! As in, I seriously wouldn’t recommend reading it in public if you want to avoid embarrassing yourself by laughing aloud while reading. The whole premise of this fic is borderline crackish, and yet, considering the characters, it’s also just believable. As such, it manages to walk that fine line between the possible and the absurd that makes it absolutely hilarious. I love the way the body of each chapter is split with part of it being actual excerpts from the Ladyblog comments section–complete with Bugaboo and MrWhiskers flirting, trolling, and playing tic-tac-toe–and the other part being real-life character interactions–mostly Alya bemoaning her troubles and Marinette and Adrien trying to hide their involvement. Very funny, all of it. This is a reveal fic, and I love the way the author handles that . . . because Nino is way smarter and pays more attention than he often gets credit for. I do have to warn that if text abbreviations, terrible spelling, and emoticons bother you, you may find parts of this story annoying; the author does a great job of making the comment section realistic in that regard. But seriously, if you’re interested in a funny (punny? ), cute ML fanfic, The Ladyblog Comment Section is a fantastic choice that I would highly recommend. NOTE: You can find The Ladyblog Comment Section at https://archiveofourown.org/works/8255729/chapters/18916784. Talk about good luck! Marinette draws Adrien’s name for their class’s Secret Santa exchange, giving her the perfect opportunity to give him the handmade coat she’s been designing just for him–with no excuse to back out in stammering embarrassment. Little does she know that he’s drawn her name and is putting a lot of thought into getting the perfect, thoughtful gift for her too. Gifts exchanged lead to more conversation, plans to hang out, and Marinette’s realization that for all the glamour of Adrien’s rich-kid/model life, he’s actually pretty lonely, especially when his other friends leave town for the holidays. Marinette’s not about to have that, so she pushes her (huge) crush on him down and determines to give him the happy family holiday he’s never had. I know, I know, this is totally out of season, but this adorable story was too utterly sweet to not post about, regardless of the season. TheLastPilot is probably one of my absolute favorite Miraculous Ladybug fanfic writers because the tone is spot on (pun only slightly intended), the plots are thoughtful and well-planned, and the characters are the best, most enjoyable versions of themselves. Secret Santa is a great example of just that. It’s mostly this sweet (like, watch out for cavities, seriously), adorable friendship-to-maybe-more fluffy story with a big emphasis on the friendship. Marinette and Adrien’s awkward but growing friendship is really fun to read, especially with the way they esteem each other’s alter-ego without knowing their true identity woven into their interactions. And yeah, we do get a great reveal eventually. But there’s a lot of these two just being teenagers, too–shopping, playing video games, hanging out with Marinette’s parents (who are also awesome)–and that is lots of fun. The sense of humor that pervades this story is just perfect, balanced with just enough angst (mostly stemming from the notorious Gabriel Agreste) to balance it out and make the happy parts all the sweeter. Secret Santa is definitely recommended, regardless of the season. NOTE: You can find Secret Santa at https://archiveofourown.org/works/5386433/chapters/12440687 or at https://www.fanfiction.net/s/11644460/1/Secret-Santa. Much as she and Chat Noir were careful to keep their true identities secret from everyone–including each other–Ladybug was well aware that they would probably find out eventually. But she never expected her superhero partner to be her hopeless crush, the boy she sits behind in class. And neither Marinette nor Adrien expected to find out by running into each other in a back hall of the school in the midst of transforming back to their normal personas. Awkward. . . . The two struggle to combine their images of each other–Ladybug and Marinette seem pretty different to Adrien, and Marinette could say the same about Adrien and Chat Noir. And how do they even relate to each other now?! The challenges of teenage awkwardness facing these two could very well be enough to break the good thing these two superheroes have together . . . or maybe, just maybe, it could be the start of something even better. Okay, this fandom is totally killing me with cuteness. I blame it entirely for my lack of posting much recently (okay, and I’ve been in a slump, but mostly I’ve been reading ML fanfic). I feel like That Awkward Moment When . . . does something special, even for this adorable fandom. Because it takes the reveal between these two and gives it to us in a lighthearted, humorous manner . . . but it also draws out a real, human side of this pair’s situation, a side that has relevance even to normal everyday relationships. It shows clearly how these two focused on each other in a surface-only manner and obsessed over someone who wasn’t even the real person at all. And it also shows a growth of real relationship that goes way beyond the surface level, becoming something meaningful and lasting and beautiful. You get a beautiful, real friendship that, yes, eventually grows into something more (but maintains a canon-typical rating, which is nice). I enjoyed the characterizations in this story, the way the people were written, as well as the writing style itself. That Awkward Moment When . . . managed to make me laugh (a lot), think, and even cry a bit at the end. Definitely recommended. Note: You can find That Awkward Moment When . . . at https://archiveofourown.org/works/7770289/chapters/17722588.